It would seem that much of the material in 2 Sam. 23:8ff. is “appendix” kind of information, supplemental to the narrative that has preceded it. v. 13 reads, “Then three of the thirty chief men went down at harvest time and came to David at the cave of Adullam. And the troop of Philistines encamped in the Valley of Rephaim.” It would seem that this incident occurred early in David’s reign, and is to be identified with one of the two campaigns of Israel vs the Philistines recorded in 2 Sam. 5:17-25. Looking out through entrance of a cave in Adulum Grove National Park. Photo ©Leon Mauldin. At this time referenced in 2 Sam. 23, a garrison of Philistines was in Bethlehem (v.14). “And David said longingly, ‘Oh, that someone would give me water to drink from the well of Bethlehem that is by the gate! '” (v.15, ESV). But go they did. “So the three elite warriors broke through the Philistine forces and drew some water from the cistern in Bethlehem near the gate. They carried it back to David, but he refused to drink it. He poured it out as a drink offering to the LORD” (v.16, NET). They fought their way, killing every Philistine who tried to stop them, until they got to the well. Drawing the water, they fought their way out, and made their way back to David and gave him the drink of water he longed for. We admire the love of these three men for David, and their devotion to him that made his wish their command. David felt that is would be sacrilege before the Lord to drink water purchased at the risk of his men’s lives. He felt that it was essentially the blood of his men since they had hazarded their lives to get him the water. The only thing he could do with the water that would be worthy of the price paid for it was to give it to the Lord, so he poured it out as a solemn drink offering to God. Lesson: All these men cared about was David. It was enough to know what he wanted, and they were willing to die to make it happen. Is Jesus worthy of any less love and loyalty? 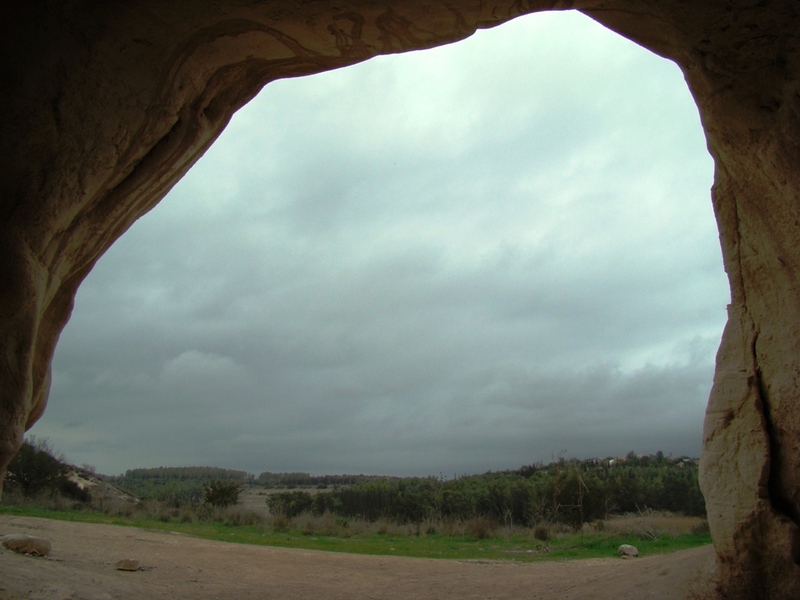 Our photo above looks out through the entrance of a cave at Adulum Grove National Park. Click on image for larger view. Quotes from my friend Bob Waldron are from his commentary on 1-2 Samuel in the Truth Commentary series. This entry was posted on Tuesday, June 14th, 2011 at 8:28 PM and is filed under Bible History and Geography, Bible Study, Israel, Old Testament. You can follow any responses to this entry through the RSS 2.0 feed. You can leave a response, or trackback from your own site.